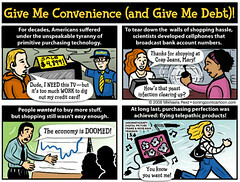 Boiling Point Blog: Feminist, LGBT and progressive political cartoons: Toon: Give Me Convenience (and Give Me Debt)! This cartoon was inspired by a column my dad sent me about RFID emitters being developed for cellphones. Obviously there are security and privacy issues involved when your credit card or bank account number is being broadcast from your phone, but that's not the point of this piece. The real thing that pissed me off is the idea that somehow BUYING USELESS OVERPRICED CRAP is so damn DIFFICULT that we need to make it even EASIER to part people from their hard-earned cash. If anything, it's way too EASY to spend, spend, spend. The statistic I generally hear is that the average American has no savings at all and is $9,000 in credit card debt. We might as well have flying telepathic products that reach into our pockets and grab our credit cards, the way we're surrounded by advertising and flooded with deceptive and manipulative marketing and pitches and credit card offers. Why do we want to make it so easy for retailers to take our money in exchange for useless crap that clogs up our lives? Features like "one-click shopping" and magical cell phones are not conveniences--they're tickets to a life as an overspent American. Masheka and I keep our debit cards (and the one credit card that we haven't shredded) in a neat little "Wallet Buddy" sleeve that I downloaded as a PDF from the Center for a New American Dream. The sleeve has a list of things to stop and think about before you buy anything, and makes you pause before buying. P.S. The cartoon title is a Dead Kennedys reference, for all you 80s political punk rock fans out there. "flying telepathic products..." That's a great, funny bit of satire, Mikhaela! Thanks!